Just when you had figured out how to manage fat, cholesterol and trans fats in your diet, researchers are now warning against another common mealtime pitfall  salt. A study by researchers at the University of California, San Francisco (UCSF), Stanford University and Columbia University shows that even a modest decrease in daily salt intake can lead to dramatic health benefits. The authors documented an annual drop of as many as 120,000 cases of heart disease, 66,000 instances of stroke and 99,000 heart attacks caused by high blood pressure after a 3-g-per-day reduction in sodium. The advantages, not surprisingly, were more profound for African Americans, who are more likely to develop high blood pressure and may be more sensitive to the hypertensive effects of salt than other ethnic groups, and for the elderly, since blood vessels stiffen with age, which can lead to higher blood pressure. "Everyone in the U.S. is consuming salt far in excess of what is good for them," says lead author Dr. Kirsten Bibbins-Domingo of UCSF. "What we are suggesting is that a population-wide effort to reduce salt intake even slightly will have health benefits." The team conducted a computer-based analysis to determine the impact of a 3-g-per-day reduction in sodium intake on rates of heart disease and death. They also calculated the cost savings emerging from the amount of disease that would be avoided because of lower blood pressure. The conclusion: by cutting salt intake nationwide, the U.S. could save $10 billion to $24 billion annually in health care costs. That's a serious amount of money, but it's the health benefits that are even more stunning. Using data from previous clinical trials on salt intake and blood pressure, the researchers found that reducing sodium by 3 g per day would be as good for the heart as cutting tobacco use by half, lowering one's body mass index 5% or taking statin medications to lower cholesterol. Even more surprising, cutting salt by 3 g per day was as effective in reducing death rates among people with hypertension as taking medication to control blood pressure. The average American man consumes 10.4 g of salt each day; the average woman, 7.3 g. The daily recommended amount, according to government nutrition experts, is 6 g. That means that even if most men were to cut 3 g of salt out of their diet each day, they would still be consuming more than the recommended daily allowance of sodium. That's why, says Bibbins-Domingo, it will take a national intervention to lower the U.S. population's salt intake. "This really has to go beyond just individual efforts in counseling patients and people in communities to lower salt in their diet," she says. "This type of effort really requires some sort of regulation and engagement in collaboration with the food industry to target slightly lower salt content in foods." It wouldn't take much to accustom the American palate to less salty fare, she says. In the U.K., government regulations lowering salt in processed foods resulted in a 10% drop in salt intake by the population, with few, if any, mourning any loss in taste. Already, a New York Cityled effort, the National Salt Reduction Initiative (NSRI), is promoting a voluntary reduction in sodium content by restaurants and packaged-food companies of 20% over five years. State and local health departments, as well as consumer- and professional-health organizations, have endorsed the effort. 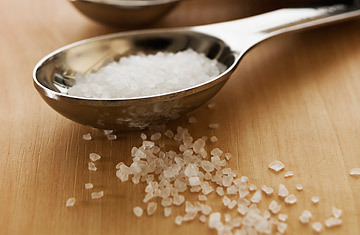 What's needed is a recognition that salt, like fat and trans fats, is not good for you. Currently, the Food and Drug Administration considers sodium to be "generally regarded as safe." That will have to change, says Bibbins-Domingo, if the American population wants to get serious about lowering its sodium intake. "Too much salt is bad for your health, and that should be considered in the way labeling works," she says. While the NSRI may be promoting only voluntary salt reduction, it's a start for getting people to consider the health effects of sodium as they would those of cholesterol and trans fats, and to keep track of their intake in order to stay healthy.